Welcome to Go Golf U.S.
First of all, welcome to our site. If you haven’t heard about us, take a look around and find out what we’re all about. Secondly, let us briefly describe to you who we are and what we do. We are a mobile app, designed to help golfers play MORE golf for less. Our mobile app allows users access to golf discounts at local participating courses for a one time yearly cost. The reduced rates on golf are given through redeemable coupons all held in your Go Golf U.S. mobile app! Rather than printing out a coupon book and passing on expenses to our customers, we developed our app allowing us to offer a disruptive price of ONLY $35! Check out an example of one of our deals below. To the right is an example of one of the courses that offers a discount through our app. The Links at Greystone is typically $60 for 18 holes golf and cart. With our app and the Rochester “eBook” (digital and in our app) it’s only $40 to play there. 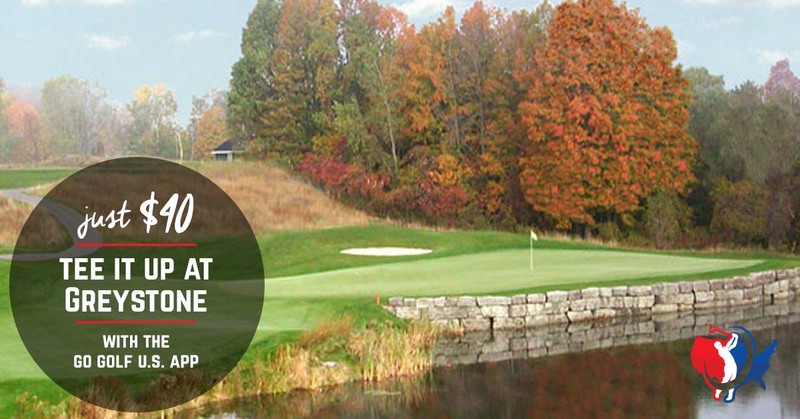 The investment for the entire year of Rochester discount golf deals is only $35. So, if you play at Greystone one time, you have saved $20 of your initial $30 purchase. Users generally break even in 1 to 2 rounds. Its a no brainer for golfers who like to travel to different courses. Simply click your app store badge below to begin the process, select your city “book” and get to saving on golf. You may also enter our business name “Go Golf U.S.” in your app store to find the app to download.Our location is currently the Rochester, NY market, but we plan to expand EVERY off season. Please contact us through social media or our contact page if you have any questions. Engagement with our users on social media is crucial to growing our business, please message us through any of the platforms for additional support.